Google the expression ‘ buyer personality types ’ and you will get a lot of articles and blogs offering the answer. Some say there are 10 types, some six and most go for a more manageable four. Look at those and while there are similarities, there are also some significant differences. While I don’t profess to be a world authority on the subject, I am a practical person and like things to be relatively simple if I’m to use them in my daily life. So, this is very much my take on what others have said. I’ve put some references at the end by way of thanks for the inspiration and to demonstrate the breadth of views out there. Time was when sales people used their self-awareness to sell more. Often assertive and competitive, the approach was unsubtle as it treated the buyers, like objectives, as obstacles to be overcome. Now, especially in B2B markets, as selling is more consultative and strategic, buyers are generally better informed. 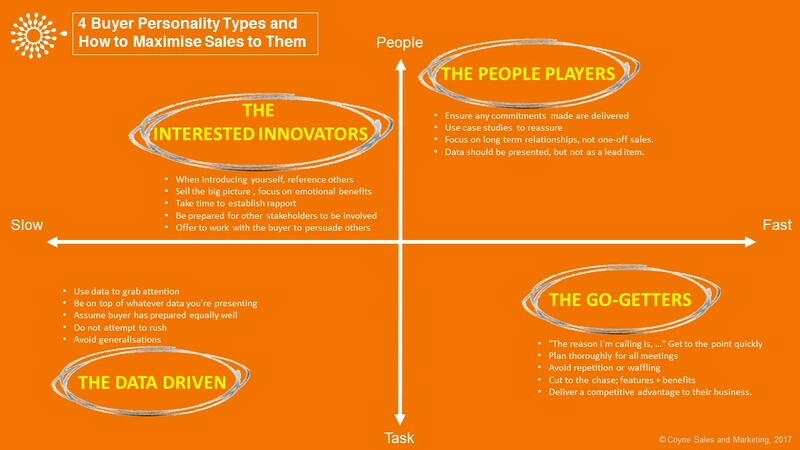 So, to excel today we need to understand the different buyer personality types better and work with them. Sales pros needs to adapt their approach according to the buyer, not themselves. As the name implies, Go-Getters are buyer personality types that are competitive, assertive and goal-oriented. This applies especially to the bottom-line goal. Personal relationships are less important than getting the job done. They are short of time and are task-driven. Quite often Go-Getters will know what they want and be confident in asking for it. They make statements more than they ask questions. They probably anticipate responses to those questions they do ask. Go-Getters are confident when speaking, maybe in loud tones and maybe leaning into you when speaking. They will show signs of impatience and are information-hungry. When trying to speak with a Go-Getter on the phone, use the phrase, “The reason I’m calling is,”. This displays efficiency and speed of getting to the point; it suits the buyer persona. Plan thoroughly for all meetings or scheduled calls. Avoid repetition or waffling when presenting. Answer questions succinctly, if you don’t know the answer, don’t guess. Always say you’ll find out and get back to the buyer. And make sure you do exactly that, rapidly. Emphasise how your product/service will solve their business issues. Cut to the chase; features without pertinent benefits won’t arouse any interest. Show how only you can deliver a competitive advantage to their business. 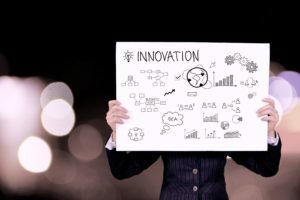 If it makes good commercial sense, give the Go-Getter the opportunity to benefit first from new innovations. People Players are concerned with human relationships and the well-being of others. They will want to understand how their decisions will impact those around them. They will use intuition in the decision-making process. While they may seem like people-pleasers, this is normally a term of weakness. People Players are in no way weak; they are often very assertive. Keeping others happy will make a People Player happy. They like to get their own way, without confrontation. Respect is important to them; they tend to be loyal to those they respect mutually. People Players have a well-developed morality and code of conduct. 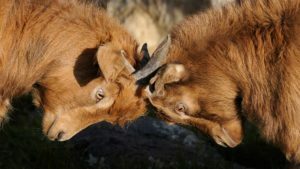 People Players are often very assertive, as they like to get their own way without creating conflict. They tend to be outgoing, creative and can be spontaneous. They will appear friendly and will want to bond with you. Ensure that any commitments made are delivered. If not, your relationship will be soured for the long term. Case studies are the best way of persuading a People Pleaser. They will be reassured by examples of how your offering has benefited others. Focus on long term relationships, not one-off sales. 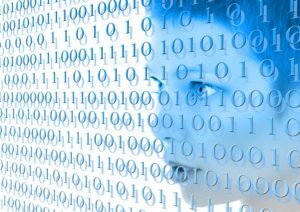 Data should be presented as evidence of the overall human benefits, not as a lead item in the case for you. Interested Innovators are buyer personality types that like the excitement of new challenges. They are enthusiastic about creative solutions to business problems. Like the People Players, they value personal relationships. They tend to be quite slow decision makers and will most likely seek the support of others before deciding. Emotional benefits often more highly valued than functional ones. Interested Innovators are good listeners and are likely to ask lots of questions. They are friendly and calm; generally quite informal and relaxed. Typically they are not structured in their approach to decision making. When introducing yourself, offer details of who else you’ve worked with. Sell the big picture. Let them feel a strong vision and demonstrate the positive business outcomes of your product/service offering. Focus on emotional benefits. Take time to establish rapport before trying to do business with them. Be prepared for previously unknown stakeholders to be involved. Make proposals detailed and capable of conveying the benefits to a diverse, ‘cold’ audience. Offer to work with the buyer to persuade others in his/her organisation. Finally, the Data Driven are the fourth of the buyer personality types. As you’d work out from the name, these are the practical, evidence-driven analysts. Logical and cautious, they are not fast decision makers, they are thorough. They seek security through data. The Data Driven tend to be no-nonsense people that seek information. Expect a lot of questions, so be prepared. Less expressive than other buyer personality types, they are less likely to get to know you on a personal level. They will be strict with deadlines. Their offices are most likely organised and ordered. Be on top of whatever data you’re presenting. Expect plenty of questions to test the rigidity of your arguments. Assume they have prepared equally well. Do not attempt to rush or push them faster than they want to go. Avoid generalisations, use data in any claims made for your product/service. Navigate 2.0: Selling the Way People Like to Buy – Hills & Reiner (Nov 2016).